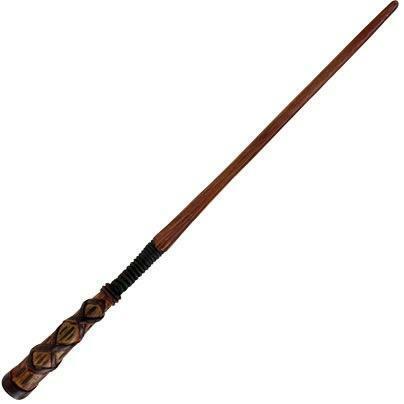 Property: The wand has 7 charges. If you are holding the wand when you roll initiative, you can expend 1 charge (no action required) to roll a d8 and add the number rolled to your initiative. While you hold the wand, you can use an action to expend 2 charges from the wand. If any enemies are within 60 feet of you, one end of the wand rapidly pulses with red light, and the wand tugs your hand in the direction of the nearest hostile creature within range. The wand detects an enemy even if it is invisible, hidden, or disguised. The wand’s detection can penetrate barriers, but it is blocked by 1 foot of stone, 1 inch of metal, a thin sheet of lead, or 3 feet of wood or dirt. If you expend the wand’s last charge, roll a d20. On a 1, the wand blackens and crumbles to dust, forever destroyed. The wand regains 1d6 + 1 expended charges each day at dawn. This pale wand is carved from aspen wood, capped on one end with a lens-­‐shaped crystal. When the wand is held, the crystal glows faintly.